We’ll never know for sure if Mexican politician Javier Zapata intended to use “#hashtagcampaña”—“#campaignhashtag” in English—as an official hashtag for his run for governor, or if it was just dummy text that made it through the printers. But if he wanted to raise his profile, it’s definitely working. It seemed like the Zapata campaign erected a mockup for a political ad with placeholder text where the final hashtag was to be printed. Social media denizens began mocking the campaign for its obvious blunder. Some in the Mexican political press asked if it was the worst political campaign in history. And even Netflix Latin America jumped into the fray, running a mock campaign for House of Cards using the hashtag. But Zapata’s people insist this was no mistake. 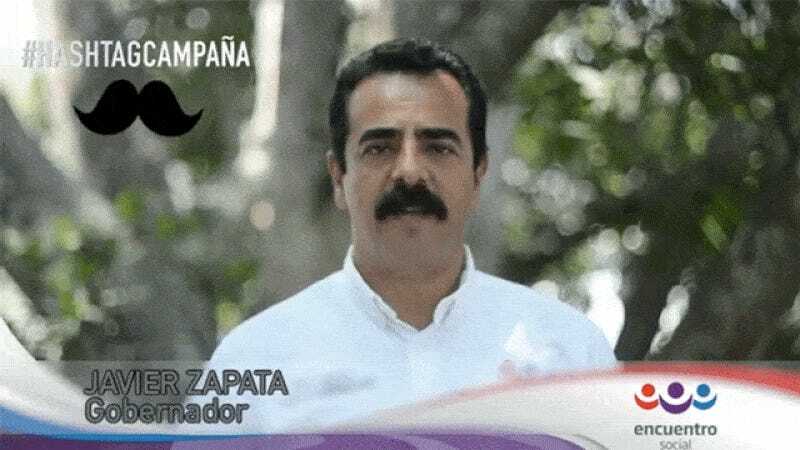 Zapata’s original campaign hashtag was “#PorMisBigotes” which roughly means “because of my mustache.” He may be a member of the evangelical Social Encounter Party—which positions itself as a rejection of “homosexual marriage, abortion, and pornographic images”— but the guy certainly seems to understand meme-ready marketing. And now, he’s spinning the #hashtagcampaña as a sort of blank slate invitation to the people. “I’m convinced that ordinary people have more experience in creating political campaign ‘hashtags’ than parties themselves or the many campaign consultants that charge millions,” he said in a statement. According to The Guardian, the airwaves in Mexico are filled with dull, interchangeable ads because candidates are afraid of doing anything that could cause them to lose the public money that’s given to qualifying parties. Intentional or not, Zapata’s approach is making him stand out from the pack. It will be interesting to see how the June election turns out. With voters around the world showing signs of impatience with the establishment and a willingness to give power to anyone who’s a little bit different, Zapata could be on to something. Never forget the Trump/Pence logo that looked like Trump’s initial was indecently penetrating Pence’s initial.